Skipping out on gluten won’t do your waistline any favors unless you do it the right way. But if you choose to go gluten-free for whatever reason, make the most of it. Celebrity nutritionist JJ Virgin, author of the New York Times best-seller “The Virgin Diet Cookbook,” advocates a gluten-free diet — as long as it’s chock full of nutritious whole foods, not processed junk. And while experts caution that going gluten-free can cause people miss out on important nutrients, Virgin says that you can get all the nutrition you need if you’re eating naturally. “You can get all the vitamins, minerals, antioxidants, and other nutrients you need from lean clean protein, veggies, low-glycemic fruits like berries, and starchy fiber-rich carbs like sweet potatoes and lentils,” she said. And when it comes to price of gluten-free foods, which always seems to be creeping up, Virgin says the key is to skip packaged foods and to include a variety of in-season produce in your regimen. Need some inspiration? Here are some nutritious, low-calorie and delicious gluten-free dishes from “The Virgin Diet Cookbook” that are a snap to make at home. Preheat the oven to 350°F. Line a 12‑cup muffin pan with paper liners. Combine the baking mix, almonds, chia seeds, flax meal, monk fruit extract, baking powder, cinnamon, and salt in a large bowl; whisk well. Combine the coconut milk, oil, and vanilla extract in a separate bowl. Add the wet ingredients to the dry, and stir with a rubber spatula or wooden spoon until just moistened. Gently fold in the blueberries. Spoon the batter into the lined muffin cups. Bake until the tops are lightly browned and a toothpick inserted into the center comes out clean, 27 to 29 minutes. Remove from the oven and cool completely in the muffin pan. Bring a large pot of lightly salted water to a boil. Add the pasta and cook according to the package directions. While the pasta is cooking, heat the oil in a large nonstick skillet over medium-high heat. Add the garlic and pepper flakes and cook, stirring, until fragrant, about 30 seconds. Add the grape tomatoes and cook, stirring occasionally, until softened, 6 to 7 minutes. Stir in the beans and cook for 1 minute. Drain the pasta and add it to the tomato mixture. Cook, tossing, until hot, 1 minute. Remove from the heat and stir in the basil and salt. Combine the lemon juice, shallots, mustard, salt, and pepper in a small bowl. Slowly whisk in the extra-virgin olive oil until well combined, and set aside. In a separate bowl combine the radicchio, endive, and arugula; set aside. Heat the olive oil in a small nonstick skillet over medium heat. Sprinkle the salmon with the salt and pepper and place in the skillet, flesh side down; cook until the fish flakes easily with a fork, 4 to 5 minutes per side. 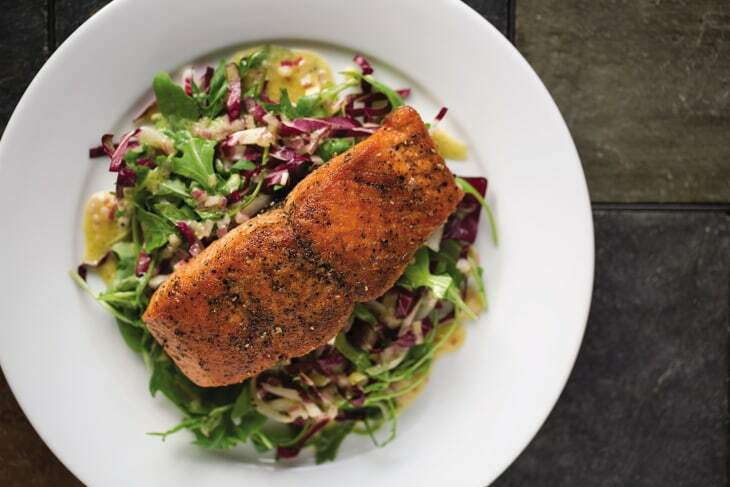 Toss the dressing with the lettuces and divide the salad between two plates; top each with a salmon fillet. Recipes from "The Virgin Diet Cookbook" by JJ Virgin. Copyright © 2014 by JJ Virgin. Used by arrangement with Grand Central Publishing. All rights reserved.